Former Shadow Business Secretary Chuka Umunna has announced he is entering the race to become the next leader of the Labour Party, after Ed Miliband resigned last week following the party’s crushing election defeat. Umuna, 37, the son of a Nigerian immigrant, announced his intention to stand in a video posted on Facebook. “I am pleased today to be announcing that I will be standing for the leadership of the party,” he said in the video. “Some have actually suggested over the last few days that somehow this is now a 10-year project to get the Labour Party back into office ... I think the Labour Party can do it in five years, I want to lead that effort. Umunna is a former lawyer who was first elected to parliament in 2010 and has been Labour’s business spokesman since 2011. The MP for London’s Streatham constituency is the second candidate to enter the leadership race after Shadow Care Minister Liz Kendall earlier announced she was running. Ex-leader Ed Miliband resigned last week after his party suffered a humiliating defeat in the general election. Other candidates vying to become leader of Her Majesty’s Loyal Opposition are Yvette Cooper, Andy Burnham and Tristram Hunt. Earlier on Tuesday, Kendall said she felt it may be time that Labour had a female leader. 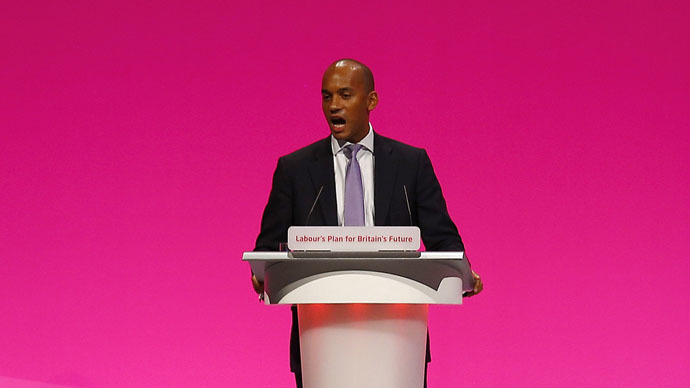 If Umunna wins the leadership bid, he would be the first black leader of any major UK political party. He is often referred to as the “British Obama,” a term he reportedly dislikes and tries to shrug off when asked. There are some similarities between the two politicians, however. Like Obama, Ummuna lost his father in a road accident. Both men also had legal careers before going into politics. When looking at Britain’s demographic landscape, it seems surprising that the country has not already seen a black politician lead a mainstream party. Ummuna said the social divide in Streatham and experiencing poverty when visiting relatives in Nigeria were major factors in him joining Labour due to its pro-working class stance.